My husband is the green thumb at our house and he grew all sorts of yummy things in our backyard this summer. We had one fabulous harvest of tomatoes and then they were discovered by the birds and squirrels...and completely obliterated! 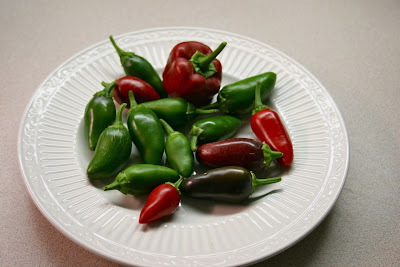 But these peppers ran the course. They are full of color, spice, and gardening love. YUMMM! Love garden freshness. It has been soooo hot & DRY here that not many people I know have even attempted a garden. Or if they did, it died :( I'm still hoping someone will leave some squash & zucchini on my porch! Enjoy your veggies!